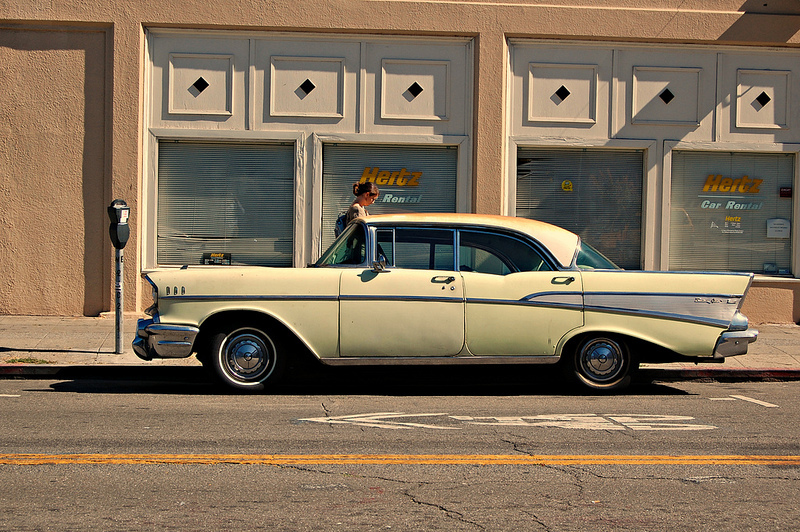 Curbside Classic: 1957 Chevrolet Bel-Air Sport Sedan – Why Can’t I Rent THAT at Hertz? 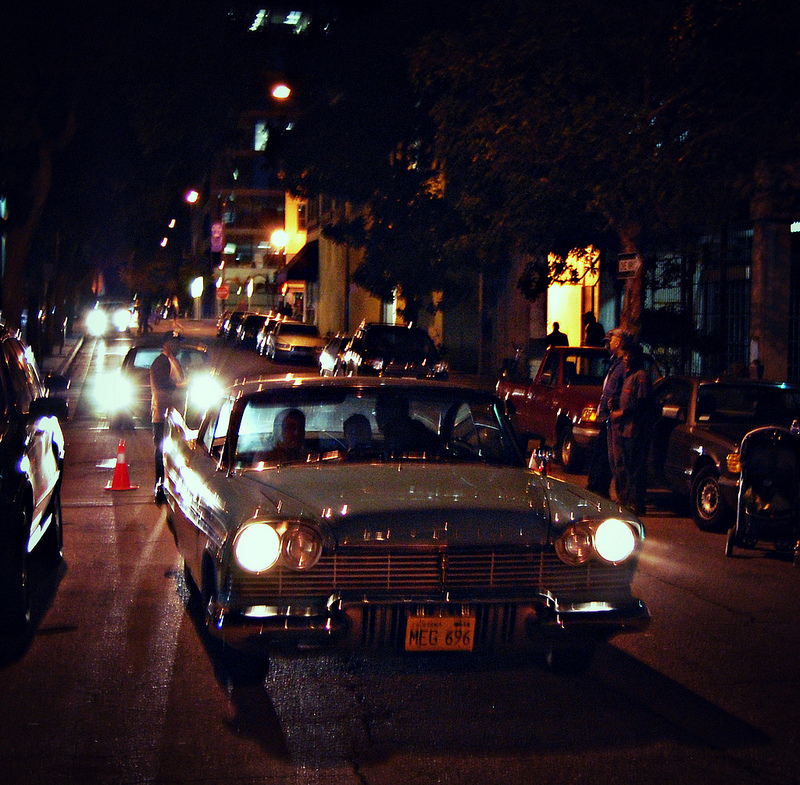 (first posted 10/18/2012) There are times when cars beg to be Curbside Classics. 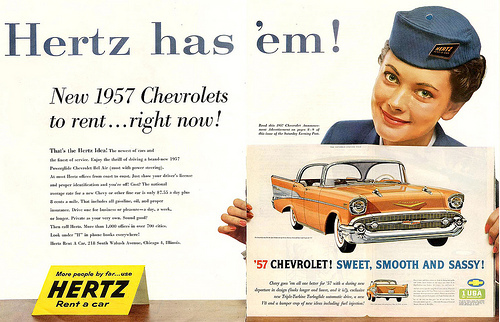 And this afternoon we have a serendipitous 55-year flashback, to a time when Chevrolet was the favored car for Hertz advertising. If Chevrolet wasn’t going to be the #1 car people bought in 1957, they were happy to be the #1 car they borrowed that year. But for a few new features, underneath our desired rental was the same Motoramic Chevrolet introduced in the fall of 1954. It was far from the staid, sedate bargain cruiser into which Chevrolet had morphed during the depression years. In actuality, it became the essential template for the preferred combination of size and power in the postwar era. A major trend that Chevrolet could not afford to ignore was the emergence of B-body four-door hardtop sedans from Buick and Oldsmobile. In view of a combined production total of nearly a quarter-million “four-door coupes” in 1955, Chevrolet (and every other manufacturer save Studebaker-Packard) cobbled together rakish and stylish new sedans that increased the bewildering number of combinations available to buyers. But automotive planned obsolescence fifty years ago is like that of smartphone technology today. For the third year of its life cycle, the Motoramic Chevrolet had two all-new direct rivals: From Highland Park , the time- traveling Suddenly It’s 1960! Plymouth line. And from Dearborn, the newest Fords the public could get their hands on since 1949. Both the Ford and the Plymouth presaged a segment-busting emphasis on “Big Car” girth and characteristics as they morphed into the size territory of recent Buicks and Oldsmobiles. And while Mopar went the tauter, torsion-bar route, Ford floated forward on Boulevard Ride softness–ironically offering Ford buyers a “Buick on a Budget” experience. All of which rendered our darling of the fleet out-of-date, in just twenty-four short months. What had been pert and perky two years earlier was now something decidedly boxy with a few baroque touches. The box sprouted fins and a heavy bumper-grille, but was still tall, narrow and upright relative to the many new and low-slung ’57 offerings. But in their rush to offer something all-new-all-over-again, Highland Park and Dearborn suffered dearly in the quality department with every finned beauty launched from their factories. What’s more, that new sleek styling meant paying a penalty in interior room, a sore point most clearly driven home by the hardtops, which were traditionally more cramped than their pillared-sedan brethren. 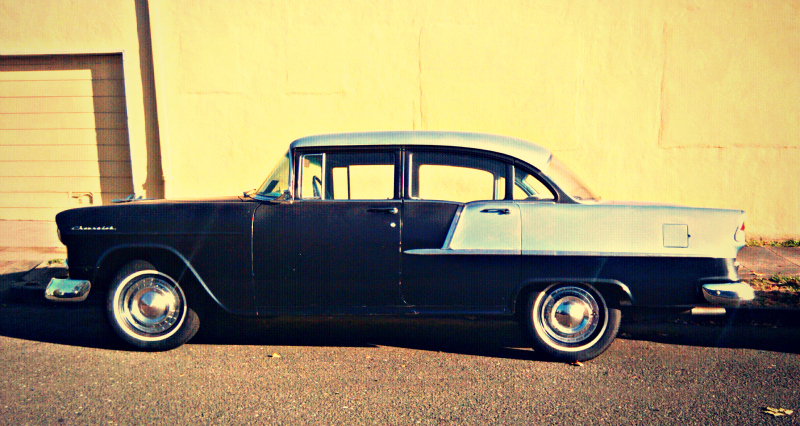 The 1957 Chevy’s more-upright stance made fewer compromises to style. Its perpetually refined mechanicals offered buyers something familiar, along with driving dynamics somewhere between those of the Plymouth and the Ford. If the Plymouth was too high strung and the Ford too marshmallowy, the Chevrolet struck a “just right” Goldilocks balance that made it a perfect car for drivers away from home. Think about it: What better car could Hertz choose to stock in bulk than the Camry of its time? Its tough and trouble-free Powerglide transmission was by now the most familiar no-shift option. The Turbo-Fire V8 gave renters enough zest to flog their poor borrowed barge within an inch of its life. And as a subtle reskin of a three-year-old design, it was a proven and pretty durable package. Of course, when you finally got to the Hertz counter, chances are you’d get a less glamorous four-door sedan and not a flashier, pillarless Bel-Air. Nevertheless, those who enjoyed their experience with their rental Chevrolet could go to the local Chevy dealer and customize a car every which way–from sedate economy queen to roller derby vixen–just by checking the appropriate boxes on a form. First up was the fantastic Fuel Injection option (full story here). 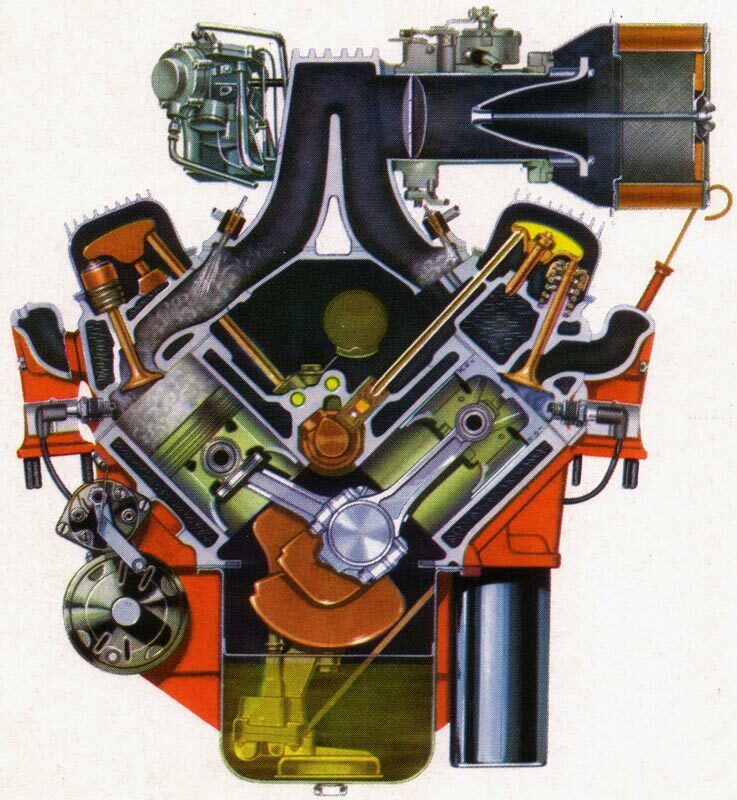 As fitted to the upsized 283 V8 with the highest compression ratio possible and Duntov’s famous lumpy cam, it put one horsepower per cubic inch in the driver’s possession. The tantalizingly lightweight bodies of the Chevrolets made the performance possibilities tempting yet troublesome. The same could be said for the underdeveloped Turboglide automatic transmission. At least one of those brazen brainfarts lives (or lived) in this not-ready-for-the-road rental Sports Sedan. If you look hard, the front fender of this Bel-Air in the air sports a ‘Fuel Injection’ badge. This combination of a four-door sedan and that high winding power plant must be pretty rare. Hopefully, this one will return to Earth soon. Bested by Ford and hampered by a resurgent Plymouth, Chevrolet did not come out on top in total sales for the 1957 selling season, despite higher fleet sales. 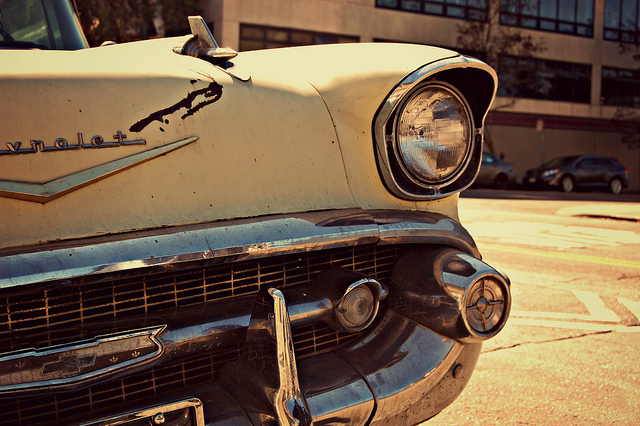 But even long after being replaced with the baroque full-sized “baby Cadillacs” of 1958, the ’57 Chevy enjoys a strong following as the best cheap used car in plentiful supply. 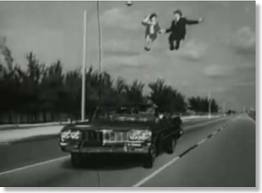 In fact, the whole “Tri-Five” cult emerged from the “that’s a great used car” appeal of the 1957 models. Long after the Belvederes had snapped torsion bars, or the Fairlane 500s had rusted away, the humble, upright original “Easy A” soldiered on, from one broke buyer to the next, with minimal attention to the Small Blocks, Blue Flames and Powerglides. 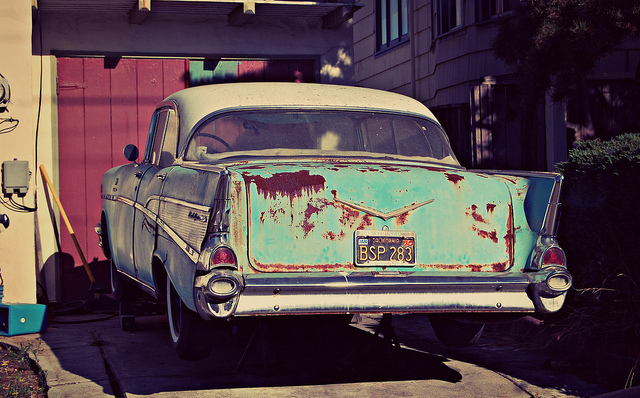 By clinging to the past in the present, the 1957 Chevrolet secured its future. And 55 years later, one of its family members reminded me that if I got the chance to borrow one, I might want to bring one home permanently. About 20 years ago, I recall one of the major rental agencies – I’ve forgotten which – offered a small selection of classics at certain locations (for some reason I’m thinking LAX and Vegas). Didn’t last very long, and I’m sure it had something to do with low demand (these rides were pricey) and I’m sure the maintenance of older vehicles was a challenge. BuzzDog, I remember similar. In fact, I remember seeing a lot of ’55 and ’56 Ford’s and Chevrolet’s for rent in Branson, Missouri, about this time in 1992. I don’t know if it was a local or chain rental, however. Laurence, you have me missing the ’55 Chevrolet 210 I used to own. Great article. Great piece, Laurence, and a really cool car. Although I am not usually under the spell of the tri-5 Chevy, an original like this, well you just have to love it. The 4 door hardtop is a really under-appreciated body style. For about 15-20 years, they were nearly universal, then they disappeared completely. I have only owned one, a 77 New Yorker – I believe that the 78 NY may have been the last one made by anyone. Oops, forgot the 63 Cad Fleetwood. They seem to survive in much lower numbers than sedans, in models where both were offered. I suppose because dowdy old Uncle Fred who took care of his stuff bought sedans, while the more stylish hardtops routinely flushed through the regular used car cycle until finally hitting the scrapyard. I also love the rental angle. Old Hertz ads seemed to feature a lot of Fords through 1956, but then seemed to go exclusively Chevy for quite a few years afterwards. Ford then got into the Avis ads, and Mopar seemed mostly out of rental fleets of the late 50s-early 60s. A four-door hardtop is as close to a convertible I feel the need to get. If the scenery is at all worth looking at, there’s no better way to enjoy it this side of a Budd Vista-Dome streamliner. Also no risk of sunburning my bald spot. That’s my understanding, too. The ’78 NYB also wore the last die-cast metal grille on an American car. And an extremely competent car, that. I’d buy one any day over an equivalent Camry/Camcord and proceed to drive it for a very long time. Not for nothing are they the Toyota Chairman’s favourite amongst his company’s offerings. Too bad we can’t get ’em. I’m talking about older Crowns and new Crown Comforts. Newer Crowns are what are sold as Lexus elsewhere. Good to read an article from you Laurence! Yes, the Japanese makes kept the 4-door hardtop around much longer in the home market (maybe even today? ), but the ’78 Newport and New Yorker were the last domestics. I didn’t know this back in 2012, but the Crown was never actually offered as a pillarless four-door hardtop (although there was a two-door hardtop in the ’70s). There was a pillared hardtop body style, but it was functionally a four-door sedan with a different roofline and frameless side glass. Mazda Luce Hardtop? Although I don’t recall if it was actually technically a hardtop or not. After having researched this point a lot more, I think the T180 Toyota Carina ED and Corona EXiV may have been the last pillarless four-door hardtops on the Japanese market, available through the 1993 model year. There were various pillared hardtops for quite a while after that, though. Ford Australia, Holden and Chrysler Australia all made 2-door hardtops in the 60’s and 70’s, but never 4-door hardtops (or convertibles of any type other than the 1989 Capri). Yes, I wondered a bit about this…they years I worked for Hertz (’77 and ’78) they seemed to rent almost exclusively Fords (though I did drive an AMC, a Dodge, Buick and a Datsun back then for them) ….but I do recall the early 60’s Hertz TV ad where they say “Let Hertz put you in the driver’s seat”, showing a guy with no apparent support gliding into a Chevy Convertible driver’s seat. Wonder how (what brands) they pick for their fleet…maybe price? I really enjoyed driving for Hertz back then (I was a menial transporter, paid less than minimum wage, but it was a fun job since I loved cars, and driving). I’d forgotten how good that hardtop sedan roofline was. So nice. It certainly updates the body. The sedan roofline looks like a leftover from the early fifties; the hardtop sedan looks much more modern, and really looks like it belongs with the ’57s front and rear ends. I had an opportunity to buy one of these – a 1957 Sports Sedan, all original, running, light blue and white, very little visible rust, all intact trim, chrome in good shape, great interior, garage-kept around 25 years ago in our neighborhood in Florissant, MO. It sure was tempting – wifey and I both checked it out, but while family finances would permit the purchase price around $2,200 according to my best memory, costs of restoring it, family and other responsibilities prevented me from bringing it home. Hey! common-sense raises its ugly head every so often! This just occurred to me…my grandfather “Albert”, whom I’ve written about here, purchased a new ’57 four door hardtop in pink and white. He loved it until my mom drove it into a ditch in ’64; he then traded for a new Bel-Air. The new owner of the ’57 later told my grandfather some kids stole it one night and wrapped it around a tree. Great article, Laurence. At the big Hershey Antique Automobile Club of America (AACA) meet this past weekend, there was a restored, red and white, 1957 Bel Air four-door hardtop on the showfield. My friend commented that it was nice to see something besides the usual hardtop coupes and convertibles that are at every show. 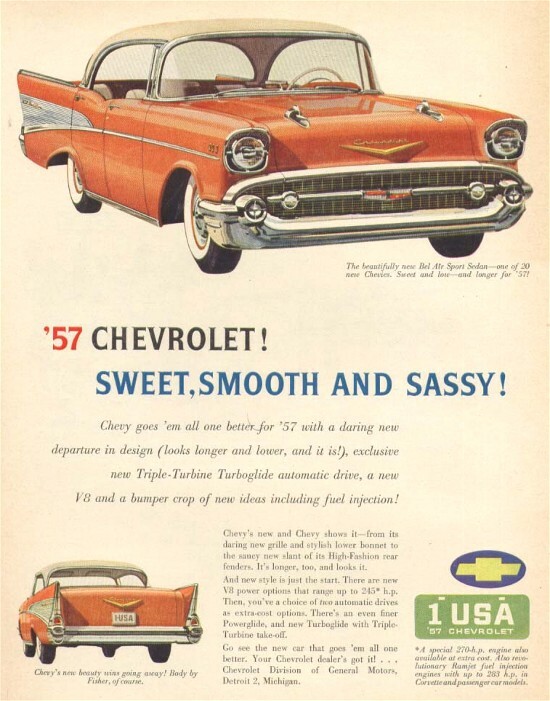 Regarding their popularity as used cars, I recall reading that, by 1961, a 1957 Chevrolet Bel Air was worth twice as much as a used car than a comparable 1957 Plymouth Belvedere! The 1957 Ford Fairlane 500 was more of a response to the Buick Special than to the Chevrolet. Ford was genuinely concerned when Buick knocked Plymouth out of third place for 1954, and stayed there through 1956. The Fairlane 500 was designed to prevent defections to Buick. Unfortunately, the Fairlane, along with the Plymouth, sparked the growth of the old Low-Price Three, which continued with the 1958 Impala and the 1959 Chevrolet. Meanwhile, the “standard” Rambler, which was close to the size and layout of the 1955-57 Chevrolets, enjoyed a sales boom as disgruntled buyers who didn’t like the size spurt of the low-price cars sought alternatives. The Rambler’s success led to the introduction of intermediates by the Big Three, which were initially the size of this Chevrolet. Good point about Buick; so we can blame them for the whole Bulge-Mobile era? The GM and Ford intermediates may have had a similar wheelbase as the tri-five Chevy, but they weren’t as roomy due to their lower-to-the ground design. The ’57 Chevy was the last of the Big Three to have both the tall, upright seating of classic American cars prior to ’57. It really wasn’t until the ’77 B-Bodies that a roughly similar package was reprised, although still not as tall. The 1954-55 Buick was a huge sales success, and it convinced both Ford and Chrysler that bigger was definitely better. Of course, customers bought those Buicks as fast as Buick could build them, so perhaps they share some of the blame. Sales of the more practical, smaller Chrysler products, particularly the Plymouth, nosedived for 1954. Both Ford and Chrysler figured that they could beat GM at its own game with low-price cars that were even larger and more radical in their style. Of course, growth in the family sedan segment seems to occur as a matter of course. Even the Accord and Camry have been inching up in size with each successive redesign. At least Honda has shaved a few inches from each end of the 2013 Accord, so maybe the growth will stop. I certainly hope so. Even though the early 1960s intermediates weren’t as tall as the 1955-57 Chevrolets, and thus not as roomy inside, they always struck me as the perfect cars from a styling and size standpoint. The 1962-64 Ford Fairlane and 1963-64 Ramblers, and the 1964 GM A-bodies offer a decent amount of room without being too large in size or too stodgy in looks. It’s always been a spiral staircase of growth. Today’s Honda Fit is about the same wheelbase and length as the 3rd-gen Civic of the mid-’80s. This includes an increase in height for the B & C segment cars over the last 10-15 years, for better interior space, harking back to the early-mid 50’s cars. Not to mention CUV’s which replicate the proportions (albeit lacking a trunk) of 1930-40’s cars. Good call, Geeber! Chevrolet “OK Used Cars” ads on television in 1960 usually featured the ’57 Chevy as one their “select” OK Used Cars. 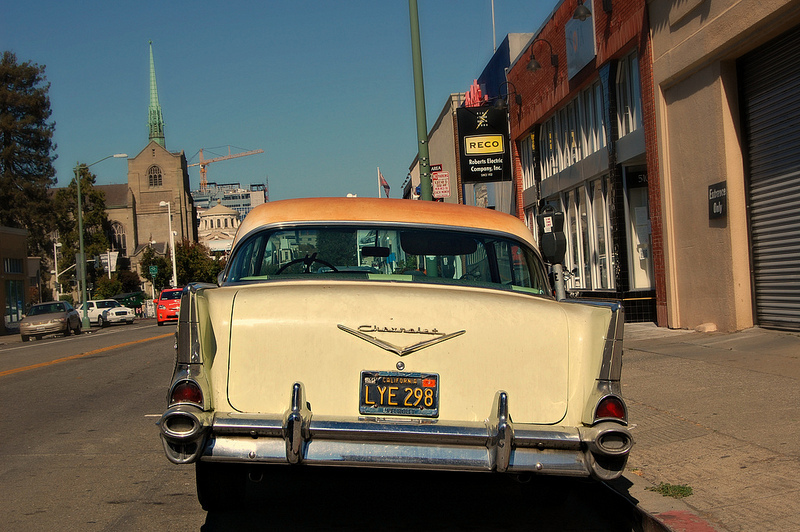 Thank You, Laurence for some good East Bay shots of the regularly seen Curbside Classic cruisers that grace the streets of Oakland, Alameda, San Lorenzo, San Leandro, Hayward, further north up the 880/Nimitz to Berkeley, El Cerrito, Albany . . . etc, etc. etc. . . . The Fairlane 500 was designed to be more upscale, but it was not a response to the Buick Special; it was intended purely to get one up on Chevrolet. I can say this with some authority because I’ve been working on a project all summer with a former Ford product planner of that era who was in fact the one who proposed the long-wheelbase Fairlane in the first place. 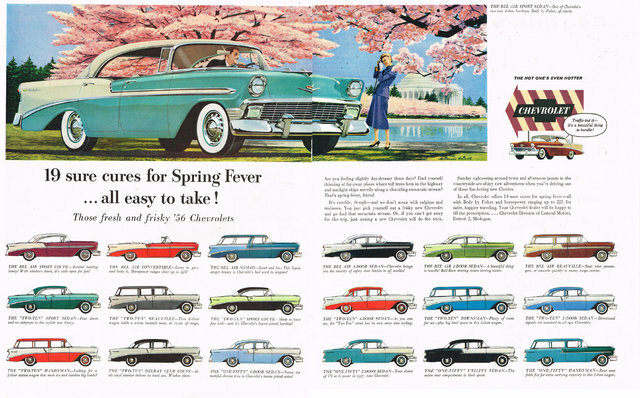 Interesting, as I recall reading somewhere – it may have been in Automobile Quarterly – that Ford was concerned about Buick’s rise in 1954-55, and viewed the Fairlane 500 as one way to prevent customer defections to the medium-price field. I’m going to say this with some trepidation, because I have the utmost respect for your thorough research. But from my (limited) experience in reading folks memories about these kind of decisions from a half century ago, I find that often the individual players remember their own particular vantage point, and perhaps not the other perspectives that went into a major decision like this one. It may not apply here, but I’m amazed how often auto industry folks (like all humans) will spend the rest of their years arguing their particular perspective/memory of how it happened. The point I’m making is: it may have been just as he said (his proposal), but I also find it hard to believe that the actual decision was made without some consideration of Buick’s very successful incursion into the lower price ranges. It seems to me that during Ford’s ambitious expansion to meet GM head-on in the 1957-1958 years, the whole entirety of what was happening (the success of Buick) must have been taken into consideration into such a considerable decision. I say this not to debate for the fun of it, or be contrary, but I’ve just learned that within a large corporation, individuals often overstate their own contribution or the effect of their POV or recommendation. But I wasn’t there, and I don’t know how influential this person was. So I’m really just speculation, or projecting. Well, it was admittedly 60 years ago, but he was head of product planning at the time and pitched the concept to Bob McNamara and then the Product Planning Committee, so I don’t think it’s an idle boast. I don’t doubt that Ford senior management was aware of the relative market position of Buick et al, but as far as Ford Division was concerned, I don’t think they saw the mid-priced market as a threat so much as an opportunity, if you take my point. It was a chance to top Chevrolet, which had been the division’s #1 concern from day one. So the ’57 LWB Fairlanes were sort of a proto-Edsel then? If FoMoCo wanted to compete better against Buick, wouldn’t they have done it through Mercury? Ford Division has always been far more powerful than the other divisions within the company (much as Dodge has carried more clout than sister Chrysler Corporation divisions). If Ford Division wanted something, it got it. It was the same with the 1958 Thunderbird, which would have made more sense as a Mercury, given its price. Remember that around this same time, Mercury tried to go upscale precisely to take on Buick. The ’57 Mercurys were much bigger than the Ford-based ’52-’56 cars and more expensive to the tune of $300-$400. It didn’t work out terribly well for them sales-wise, but that was the plan. I would have been 6 when that commercial ran, and I was quite fascinated with it! It looks pretty low tech now, but in the 60s it was wild! No kidding about the F.I being, ahem, troublesome. Junior year of high school (’82) got to drive a injected ’64 vette. What a crappy running POS. Rochester might as well have trained a monkey to sit under the hood and drizzle gas into the manifold. In all fairness, the real issue with the Rochester FI was grease monkeys who could not resist the (then) grease monkey requirement to believe they are smarter than the engineers who designed the thing and therefore screw with it. Had GM encased the throttle body with a Mosler safe with ten digit combination chances are the FI would have been lauded as the best thing since four on the floor. The issue with your FI Vette probably had a lot to do with the fact the car was 18 years old at the time and had been “tuned” but high school kids. Over the years, we had a terrible time keeping our mechanics following factory specs. Practically all of them thought they knew better than factory engineers. Fortunately, this all ended when proper port fuel injection and coil pack ignition came on the market. Cars now run much better for much longer. +1. I still sometimes face this problem today with mechanics. Can’t imagine what it must have been like in 1964. Unless one has a proper lab and tools, factory spec is the way to go. Nope. It was his dads, who was the service writer at Knuass Chevrolet in Tigard, Oregon. Yes the car was 18 at the time, but in showroom condition. And, as a professional marine service tech, I can assure you a lot of sharp techs do know more than factory engineers, who never had to deal with the crap they designed after it left their drafting board. I am one of those techs, I have gone toe to toe with my share of so called factory engineers and the company’s usually useless field rep’s, most of which could not pour beer out of a boot if the instructions are printed on the heel. The vintage B/W picture above is Chicago Midway Airport. Also, the car available are actually Bel AIrs. 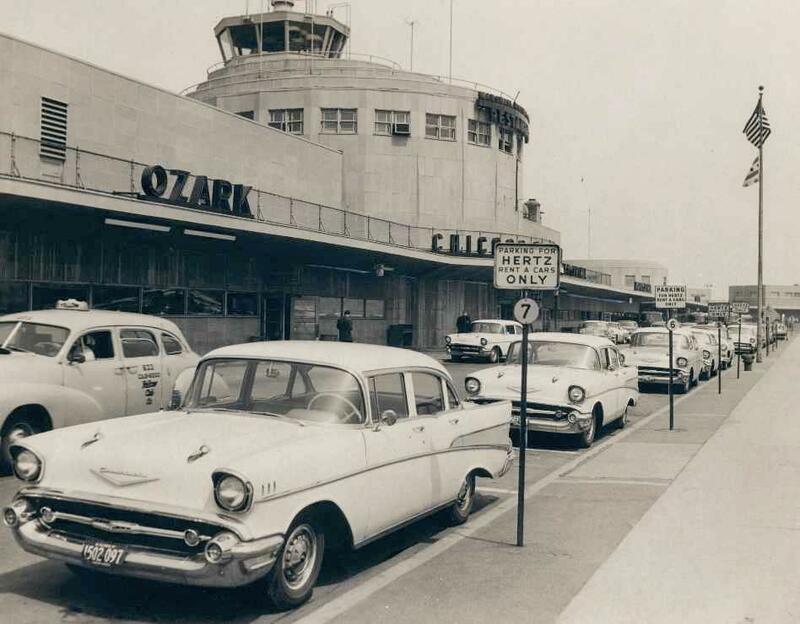 Hertz was promoting Car Rentals to the masses for vacations, a new market then. Before, rentals were business only. 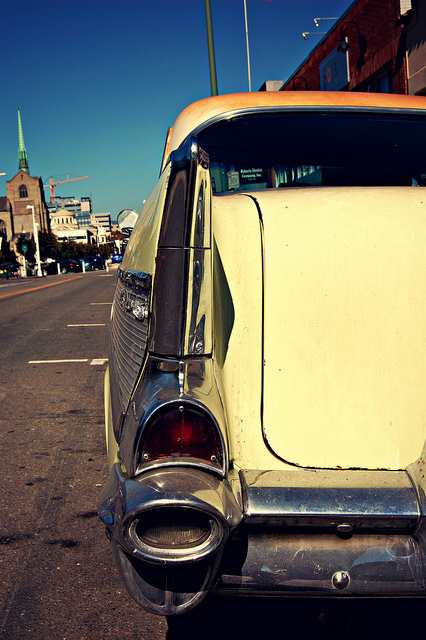 Used Tri-Fives outlasted their competition on the roads and hearts of drivers for decades. Remember the AMT 3-in-1 kits? Stock, custom or competition. There’s a Chevy fanatic in town who has all three ’57s for real, and brings them out on nice days. A plain white sedan, a mild custom in red with the tuck and roll, and a blue hardtop set up for the strip. I’ll get a photo and more details next time I see them. This is the one Tri-Five I can do without…even preferring a 150 4-door sedan to this hardtop. From a restoration standpoint, the parts unique to this model would make it more difficult to restore than the more-common 2-door HT or convertible as most everything for those models has been reproduced for quite some time. Plus, I also assume that despite the extra bracing in the structure where the “B” pillar used to be, a 4-door HT has to be more rattle and leak prone. Just guessing. I don’t think they gave the frame the extra “X” brace the convertible frame received. Anyway I’m perfectly content with my Handyman project. Classic Industries just introduced a new floor pan with the weld-thru primer…even though I could easily patch my floor together I’d like to do it right the first time and so will probably go that direction. I’ve always been a Tri-Five fanboy but have only come recently to learn just how poor the quality of the Ford/Plymouth competition was in ’57, which only increased the 55-57’s stature on the used car market. My dad never bought hardtops for this exact reason; even if they weren’t loose and rattly when new, a year later they would be. I remember how hard it was to get doors to close properly on these things and how bumps made the entire car shake. Mind you, all X-frame GM cars were pretty rattly. The hardtops were the worst. Years ago, I saw a 56 Buick 4 door hardtop with a definite sway in the structure. It was so noticeable that the tops of the front door windows overlapped the tops of the rear door windows by about an inch. The car must have had some significant structural rust, or else had been jumped over one too many railroad crossings. I should add that both my 63 Cadillac and my 77 New Yorker 4 door hardtops were structurally very tight cars. The Cadillac was about 15 years old at the time, and the Chrysler was about 8 years old. 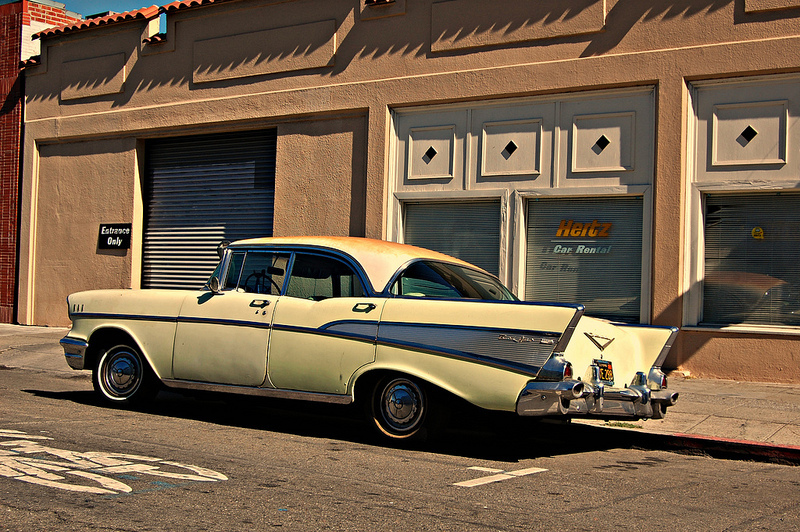 I remember riding in a ten-year-old ’57 Bel Air 2-door hardtop that was one of the most clattery cars I ever rode in. The owner excused this by telling me that he’d pieced it together from a couple of different wrecked cars. His choice of a 327 engine and 4-speed transmission probably wasn’t optimum from the standpoint of having the body last a long time. A friend has a ’57 150 2-door sedan, black with white rear fender tops and trunk, and a 283 V8 and 3-speed – a nice car, and all original, even to the paint. Riding in it really reminded me of that black Bel Air so many years ago. I remember reading quite some time ago a writer who thought the great popularity of the 1957 Chevies was because the “gunsight” down the hood gave a better view from the driver’s seat than did the otherwise better looking 1955 cars. I admire the ’56 and ’57 Bel Air and 210 four-door hardtops. Sure, I’d love one – or a sedan too. The coupes and rags have long been snapped up and I’d have no problem piloting a “Blue Flame” Six w/Powerglide. Nice Oakland shots! Is that just south of Lake Merritt? Just Northwest, behind the new “Cathedral of Christ of Light” between 20th and Grand on Webster. Was picking up a friend from Mass, and I guess someone that goes to the Kickboxing studio next to the Hertz owns it. These cars’ driving position is very similar to the Fleetmaster/Stylemaster or the 40s, unlike the markedly lower Plymouths. I’ve not seen any Fords of this vintage. I like the tall, commanding view from these cars. Give me one with a six and three on the tree! I only sat in a 57 Chevy one time many years ago. It indeed seemed high, narrow,and the steering wheel was huge. I guess no power steering. There’s a guy who sells high end 55-57’s a couple blocks from me. He’s listed in the phone directory as a collector car dealer. I would guess his cars sell for big bucks, they really look like the cream of the crop. This summer, he’s had 4 or 5 different cars with for sale signs. I’ve stopped to look a couple of times, never met the guy, though. He only has one car out at a time. Back when I was in high school (1968), a boy that lived up the street had a silver gray Bel Air 4 dr HT, with chrome reverse rims and baby moons. An eleven year old new car, everyone used to drool over it. Many guys had 55-57 Chevys, but none were in that immaculate condition. I think it was the only silver gray Chevy I ever saw of that vintage. On another note, I remember cheap ball point pens in the popular car colors back in the 50-60’s. Two tone and monotone pens in metallic automotive colors, selling for about a buck. Even if you couldn’t afford a car, or weren’t old enough to drive, you might get a pen for Christmas or birthday. I had a ’56 two door station wagon for four or five years in the seventies. Totally slick, no trim. with a six and three on the column. Only extra was a heater. I used it to bring my new son home from the hospital because the new Mom only had to turn around and sit down. I wound up giving the car to a friend after his car was wrecked and he couldn’t afford to buy another one. Like everyone else I would like to have that one back. Always thought the two door sedans and wagons were timeless beauties. The hardtop not so much. That’s just because I know what the hardtops turn into. The wagons really catch my eye. I cannot agree with the “trouble-free” characterization of the 1957 Chevrolet, though that opinion is colored by time spent helping my Dad fix our 1957 Two-Ten six-passenger four-door station wagon. Bought brand new in two-tone..Surf Green roof and rear quarter spear, and Highland Green main body…it boasted the (in)famous Splash and Clatter Blue Flame Six and Powerglide transmission. It probably seemed like another whole generation of car compared to what it replaced, a 1954 Plymouth Savoy (an ex-taxicab) with flathead Six and HyDrive transmission. But later generations, the passage of time and the accumulation of miles would find the 1957 Chevrolet wanting. The engine was a weakness. Around town, where it didn’t run for very long, it did all right. But on road trips, such as the three-hour drive to visit Dad’s best friend in the San Joaquin Valley of California, it would punch out its valve stem caps with regularity. Twice that happened; at least that ailment could be fixed without pulling the head. Another two times, the involved valve bent and we spent the rest of the day sweltering in the summer heat while the cylinder head was pulled and the valve replaced. Fortunately, the valves seemed to be a commodity available from the mechanic’s junk box, or perhaps at Joe’s Small Town Auto Parts around the corner. The car never got laid up overnight for want of a part. Finally, an aftermarket kit to provide better pressure lubrication to the cylinder head was installed; we could visibly SEE oil being pumped over the valve train. We never had another failure but wondered why General Motors couldn’t have incorporated that fix in the car from the factory, instead of saving the $5 that the kit cost (it would probably have been $2 in GM-size quantities) and foisting those valve problems onto their unsuspecting customers. The front wheel bearings on that Chevy would get noisy in a very few thousand miles after each replacement. These were BALL bearings, not the far more durable ROLLER bearings that came later, and each time the bearing races came out brinelled and spalled.. Long after the 1957 Chevrolet was gone from our garage, we learned that the “new” way of lubricating those bearings was with a much thinner lubricant, almost like a thickish oil instead of the paste-like, dark wheel bearing grease we’d always been told to use. It was said that the thinner lubricant had better film strength, so it didn’t have to be so thick. It would better spread itself in and around the balls in the bearings, providing more lubrication and more cooling of the bearing. “Better living through chemistry,” perhaps; that DuPont advertising slogan being reminiscent of the long-time association between DuPont and General Motors. 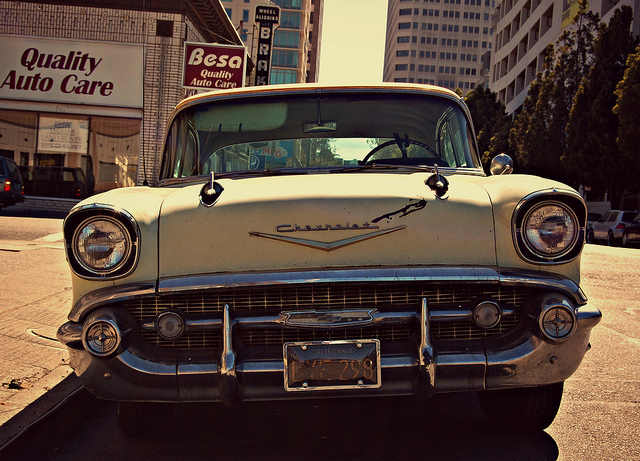 What ended the 1957 Chevrolet for us in 1964? Rust, even in rust-free California. The left rear door rotted out from the inside. Maybe some auto worker forgot to spray the inside of that door with primer, or whatever was supposed to stop it from rusting? NONE of the other doors was rusting but we’d had it. The 1957 Chevrolet Two-Ten six-passenger wagon was sold off at age seven. Interesting comment on the bearing grease. I used to see a lot of old cars missing hubcaps, with the wheel bearing grease streaked all over the wheel centre after being flung out from the hub. I don’t blame you for feeling that way considering the troubles you had. By the time I owned my ’57 150 2-door sedan, roller bearing conversions were pretty common and inexpensive. I forgot the original application for the roller bearings, I wanna say ’61-’64 full-size. But the ball bearing front hubs were a weak point, and the races were always damaged as well. I wonder if that no-flame 6 had an oil filter. IIRC they were still an option on the 6’s. I’d owned several of them back-in-the-day, by chance rather than choice. Front wheel ball bearings must be installed with a fair amount of pre-load (forget the figure, something like 35 ft lbs, back off, then 13 ft lbs and you’re done) which would crush a tapered roller set. That’s why they brinnelled (hammered to death). When set up, nothing rolls like a ball bearing set up, so smooth and dead quiet. Had them in the 57 Olds Fiesta Holiday (yeah, four door hardtop wagon goodness, baby) in the 70’s. Took it from 150k to 180k miles in a few years, never any troubles with them. Oh, might as well add, 4dr ht, NO rattles or anything unless really wailing on back roads. Close any door with fingertip pressure (click-clink) and it was like a church inside. An old-fashioned down-town church. I couldn’t get the editor to work last night/this morning; I hope nobody set up their 57 Olds since then with these torque values which are for a 55 Corvette, the last one I did and the no’s got stuck in my mind. Right no’s for Olds: initial 17 ft lbs, finish at 4. Always while keeping the wheel rotating of course. What’s cool is 4 doors versions of popular classics are being restored or saved, instead of cut up for parts. But also, seems like Tri-5’s were more commonly seen in the 70’s, than 58-60 Chevys. I’ll bet there’s a market out there for reproduction cars from the ’50s-’60s with exactly the same styling/interiors but modern mechanicals and electric power. If they’d offer a modernized reproduction of this car I’d be at my Chevy dealer when the first one rolled off the truck. Check in hand. Dave I think a lot of people would be! I think it’s the magazine Collector Automobile, but this month one of the articles being featured is on the Tri-Five 4 door hardtops. There’s also a good article on hardtop station wagons.